The Connemarathon has truly become an International marathon. In 2018 there were participants from 37 countries and a large number in particular from France who came to run the half, full and ultra marathons in this stunning part of the West of Ireland. This is a special place and we look forward to welcoming our overseas visitors again in 2019. 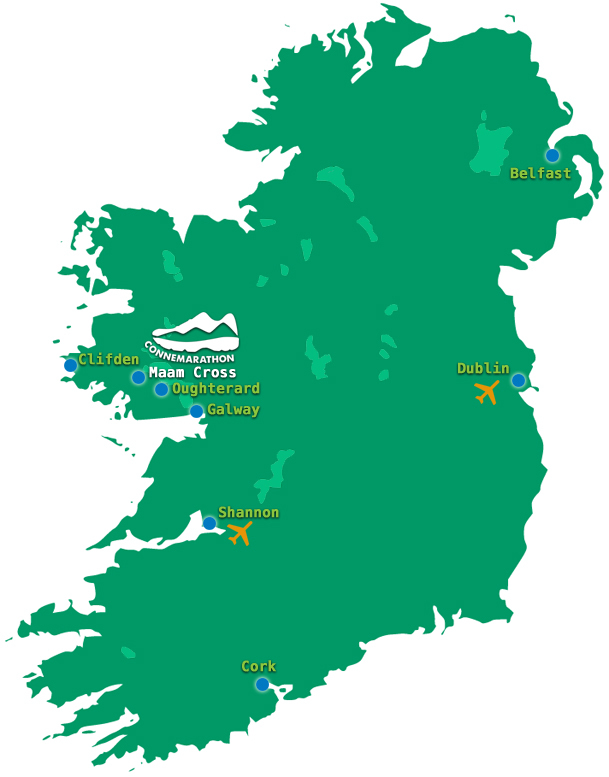 The main Irish airports are in Dublin and Shannon, while Galway, Maam Cross, Clifden, are Oughterard are great places to stay. Bus transfers to the start line are from Galway, Oughterard and Clifden (more details and maps here). Race headquarters are at Peacockes Hotel in Maam Cross, which is where all three race distances finish. www.connemara.net has great information on what to see and do in the area. Make sure you visit this website to plan your trip and experience the best of this breathtaking part of Ireland.